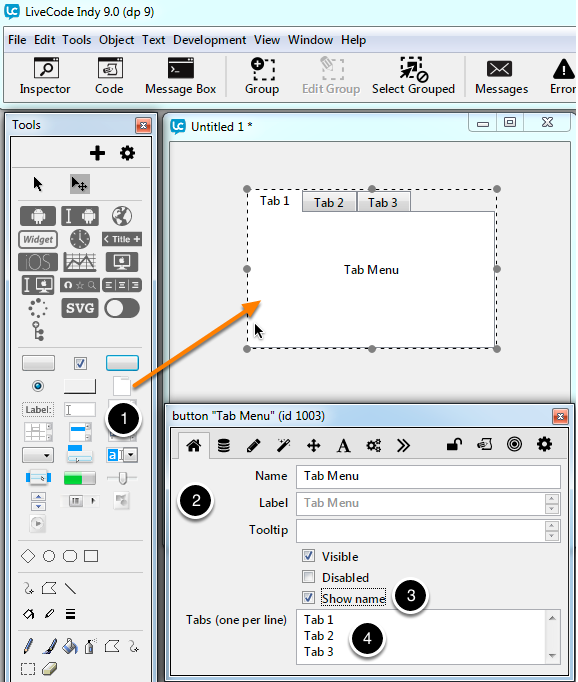 This tutorial introduces the tab panel and shows you how to populate the display area with text information. The tab panel is versatile and can be configured for navigation around cards and stacks or simply to display information in the panel itself. 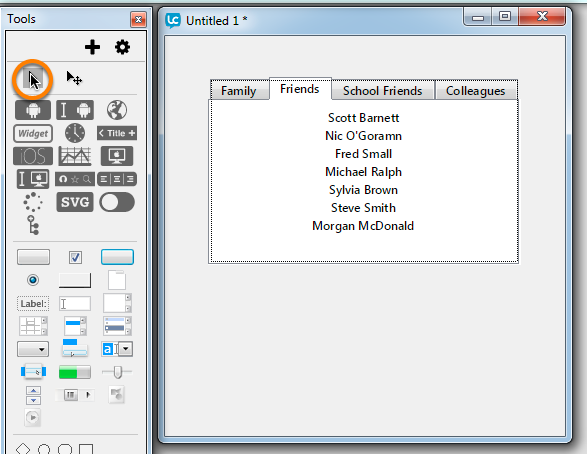 This tutorial demonstrates how to create four tabs and populate the panel with the names of people who fall into a category that can be selected from the tabs. Open LiveCode and select New stack from the File menu. This creates a new stack window on which to create the tab panel. Drag and drop a tab panel onto the card of the stack (1), then right click on the tab panel and select the Property Inspector (2). Make sure that you have selected the Basic Properties from the Property Inspector tabs. In order to display content on the tab panel ensure that Show name is ticked (3). Then update the content of the Tabs (One tab per line) field (4). You need to separate the names of each tab by returns. The default is "Tab 1" return "Tab 2" return "Tab 3". We are replacing this list with "Family" return "Friends" return "School Friends" return "Colleagues". Once you have made these change, close the Property Inspector. You may find that the tab panel window is not wide enough to fit the content from all four tabs. Widen the window by dragging and dropping the small rectangle boxes at the sides. You should be able to fit all four tabs into the LiveCode stack window without having to resize that. set the label of me to "Mum" & return & "Dad"
set the label of me to "Claus Knorr" & return & "Gunnar Diem"
return & "Sharron" & return & "Jean"
Don't forget to click Apply. Switch to Run mode, and try out your tab panel. You should see it switch between the different lists of people entered in the code. If you like this tutorial and would like to find out more about using the tab buttons, then you can read more about how to use the tab panel in the lesson: Using Tab Buttons. Nice tutorial! But if you want to create or change a tabbed menu at runtime, you need another way. how can I close a substack and go back to the main stack? and how can I close all (when in run mode)? Sometimes instead of "Display Name" appears "showName". Just tick the checkbox and each tab displays all names correctly. You can do this is script using the close command, e.g. The close command closes the stack window immediately, but it does not necessarily remove the stack from memory. A stack that is closed but in memory still takes up space in RAM and its objects are still accessible to scripts. If you want to explicityly navigate to another stack you can use the go command. Is there a way to make the tabs appear at the bottom or one of the sides of a tab panel instead of the top? You can't do this with a tab panel, however we have a Segmented Control widget which you could use to achieve a similar effect. This would allow you to place the control at the top or bottom on the panel. In LiveCode 9.0-dp-9 we have also added the option to create a vertical segmented control. I have a Question regarding these Tab Menues. Is there a way to bind buttons and fields to a specific tab? 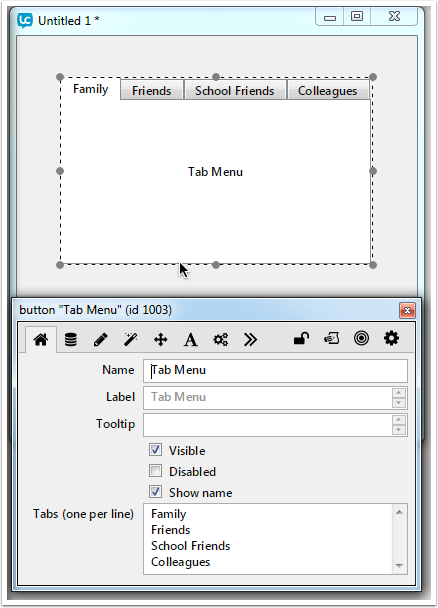 Lets say I want to add a Button to Tab 1 that brings me to Tab 2. Problem is that the button stays even if im already there. Do I have to make them dissapear everytime I switch or can I connect the button to the tab? Hi EL_C, the way to do this would be to have a group of controls associated with each tab, the show and hide the groups when the user selects a tab.